Kafundó Records was founded in Rio de Janeiro by Wolfram Lange aka SoundGoods and Maga Bo in 2013. “Cafundó” means a far away and isolated place in Brazilian Portuguese. Beyond the favela/asfalto binary that exists in Brazil’s urban areas, there are alternative spaces that exist both within and outside the city. These places are “far away” from traditional Brazilian social politics. The most commonly recognized such place is the Afro-Brazilian “quilombo” the Brazilian version of a maroon community. This third space within the Brazilian social geography is the source material of inspiration for many of the songs on Kafundó Records, music from the neglected peripheries of the Brazilian music scene. Not only using Afro-Brazilian traditional rhythms and instruments, many of these artists on Kafundó Records look beyond Brazil to the greater African diaspora. Songs using Brazilian popular rhythms such as Coco, Forró, and Carimbó are fused with digital styles formed in the ghettos of Jamaica and the United States. In this they aim to reframe the sometimes-conflict-ridden Brazilian identity politics, to represent as participants in, and in solidarity with the global African diaspora. The result is Afro-Brazilian electronic music with regional or folkloric elements. Naturalized in Rio de Janeiro, Maga Bo is an internationally acclaimed musician and dj working with a collision of styles, sounds, location recordings from all continents and beats that have yet to be classified. 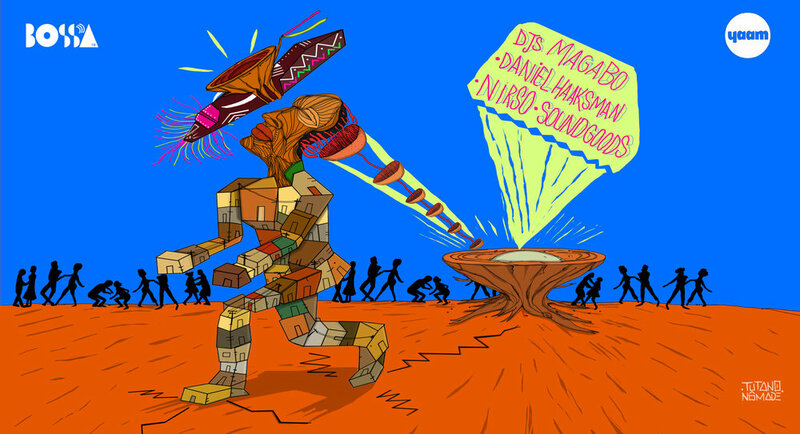 Tropical bass pioneer Daniel Haaksman is a Berlin based artist, DJ and producer as well as label head of Man Recordings. Rodrigo Fonseca (aka Nirso) ia a Brazilian DJ and producer that mixes latin american with Brazilian music, breaking the boundaries that separate Brazil from the rest of Spanish-speaking America. Wolfram Lange aka SoundGoods is co-founder of Kafundó Records and runs the website soundgoods.net where he presents his selections of musical adventures from trips around the globe.